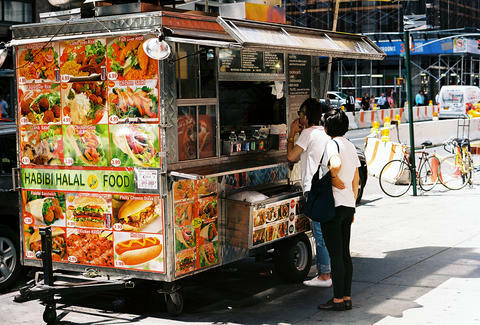 Although street food carts are as New York as the Yankees, rats, and overpriced apartments -- one man wants to eradicate them. According to Crain's New York Business, Dan Biederman, president of the 34th Street Partnership and the Bryant Park Management Corp., wants to banish the street-food slingers from the sidewalks around Macy's and Bryant Park in Midtown. Biederman claims the food carts congest walkways, are unattractive, and get unfair exemptions that actual restaurants don't. He described the food vendor problem as being "out of control" with the carts being "bigger, uglier, and some of them extend to as high as 20ft." He even met with New York City Police Commissioner Bill Bratton over the summer, whom he said "listened carefully to our case." Although Biederman has appealed to higher powers, he's also taking on harsh criticisms from street food supporters like Sean Basinski of the Street Vendor Project (part of the Urban Justice Center), who believes that Biederman is racist against the vendors, who are mostly minorities or immigrants. Even if you never eat from those carts, it's comforting to know they're out there every day. Should Biederman accomplish his crusade, love it or hate it, the congested-anyway streets of Midtown just wouldn't be the same without that distinct Nuts 4 Nuts-hot dog-pretzel-Halal food smell. Pete Dombrosky is an Editorial Assistant at Thrillist and he thinks removing pretzel and hot dog carts from anywhere in New York would be like plucking stars off the American flag. Find out why on Twitter.